Francis Talbot was born in 1500 to George Talbot, 4th Earl of Shrewsbury and his wife Anne Hastings. Francis’ father, George, fought alongside King Henry VII during the uprising of Lambert Simnel and the Battle of Stoke and was godfather to Henry’s eldest daughter, Princess Margaret. In 1538 Francis inherited his father’s title to become 5th Earl of Shrewsbury. Francis followed his father’s footsteps and was in favour with King Henry VIII during his reign, despite being a staunch Roman Catholic. Francis even received lands, including parts of Worksop Priory and Beauchief Abbey, from the dissolution of the monasteries. On 30th November 1523 Francis married Mary Dacre, daughter of Thomas Dacre, 2nd Baron Dacre, the couple went on to have three children; George, 6th Earl of Talbot, Anne and Thomas. Mary died in 1538 and Francis went on to marry again to Grace Shakerley but they would not have any children. Francis took little interest in politics however, in 1545 he was made a Knight of the Garter and Francis was also deemed a powerful figure in the north of England and was part of the troops that invaded Scotland in 1547 that ended in the Battle of Pinkie Cleugh. During the reign of King Edward VI the Imperial Ambassador described Francis as ‘one of the most powerful men in the kingdom’ and when plots arose against the Lord Protector, the Duke of Somerset he attempted to recruit Francis to his side but instead Francis joined those that opposed his rule. In 1549 Francis replaced Robert Holgate, Bishop of Llandaff, as Lord President of the Council of the North. When King Edward VI took to the throne Francis converted to the reformed religion but harboured sympathies to the Catholic faith. Francis, although not a politician he was a member of the King’s Council. 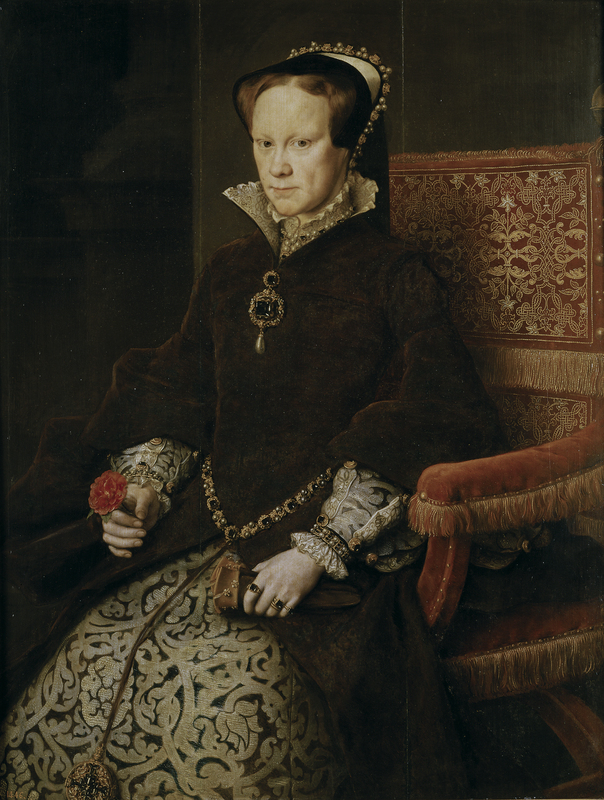 Despite converting to Protestantism and not opposing the proclamation of Lady Jane Grey as Queen after the death of King Edward VI, it is likely that he would have worked to convince the Council to recognise Mary I as the rightful heir and was one of the first to openly support her claim. Due to his early support Mary rewarded him upon her ascension with a place on her Council. Francis, during the reign of Queen Elizabeth was Lord Lieutenant of Yorkshire alongside his role as President of the Council of the North. 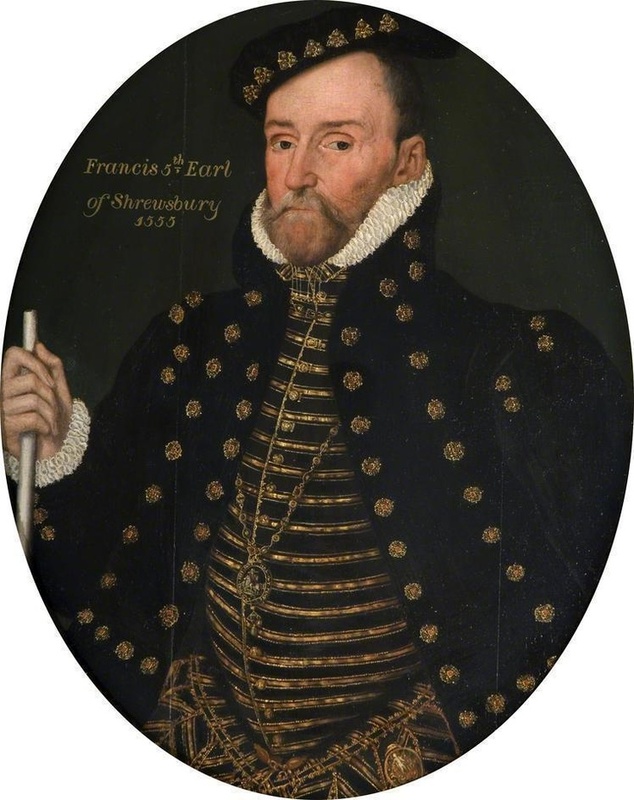 In a letter from Francis to Sir William Cecil dated on 17th January 1559 from Ferry Bridge he stated that he was going to take some troops to Newcastle and whilst he was away he was appointing his Vice President, Sir Thomas Gargrave to do his job in his absence. Francis Talbot died on 28th September 1560 in Sheffield Manor, Sheffield and was buried at St Peter’s in Sheffield. On 14th August 1513 William Parr was born to Sir Thomas Parr and his wife Maud. Thomas had two sisters Anne and Catherine, the sixth wife of King Henry VIII. On 9th February 1527 Parr married Anne Bourchier daughter of Henry Bourchier, 2nd Earl of Essex. The marriage was not an easy one and in 1541 Anne eloped with her lover John Lyngfield, the prior of St. James’s Church, Tanbridge and they had several children. As a result of this Parr was able to annul the marriage via an Act of Parliament and on 17th April 1543 and Anne’s children were declared illegitimate. As a result of the Act Parr obtained his wife’s lands and titles and as a result was created the Earl of Essex. Parr was able to achieve this due to his high position within King Edward’s court and the influence he held over many. Parr went on to marry Elisabeth Brooke. Elisabeth had been married to Sir Thomas Wyatt, who had been implicated in Anne Boleyn’s downfall; they had a son with Wyatt who went on to be Sir Thomas Wyatt the younger. Elisabeth fell in love with Parr whilst still married to Wyatt and they lived in adultery and later married whilst Wyatt was still alive, therefore the marriage was bigamous The validity of the marriage was contested as during Henry’s reign a divorced man could not be allowed to remarry but this law was rescinded by King Edward and their marriage was legal. However, it was again overturned by Mary before once again being revoked by Elizabeth. 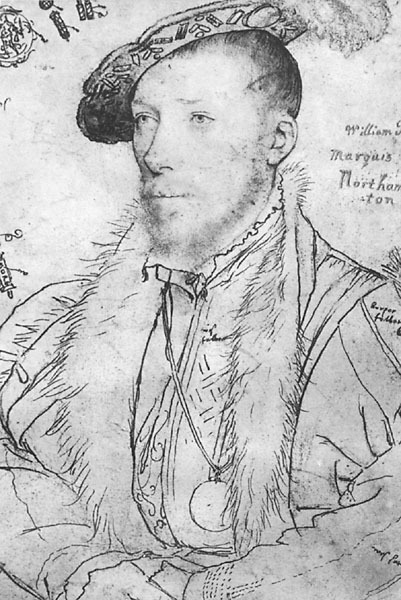 Parr had many titles bestowed upon him alongside the Earl of Essex in 1539 he was created Baron Parr of Kendal and in 1547 he was created the Marquess of Northampton. After the death of King Henry VIII Parr being the King’s brother in law and therefore step-uncle to the new King, Edward VI, Parr was one of the most important men in the new Council. He served Edward loyally and when it was clear that the King was dying Parr along with his wife worked with John Dudley to place Lady Jane Grey as the successor to the throne. Upon Queen Mary’s ascension Parr was arrested on the charge of high treason and sentenced to death on 18th August 1553, however, he was instead released and eventually had his titles restored to him by Queen Elizabeth in 1559. In 1565 his wife, Elisabeth, died aged 39 heavily in debt as she attempted to find a cure for her ailment which was believed to be cancer. Five years later Parr would marry Helena Snakenborg who was a lady in waiting from Sweden. This marriage would be short lived as Parr would die five months later at Warwick Priory. With no children his titles became extinct. On 19th July 1553 Henry VIII’s first born child was declared Queen of England following the death of her younger half brother, Edward. Mary route to the throne was not easy as Edward in his will declared Lady Jane Grey as his heir, contravening what Henry VIII had laid out in the Third Act of Succession. However, Mary strongly believed that she was the rightful heir and began gathering support. Mary was unaware of the change of support from the council and that they had proclaimed her the rightful Queen of England until the following day when William Paget and the Earl of Arundel arrived at Framlingham with the news. After being named as King Edward VI’s successor Lady Jane Grey was taken to the Tower of London on 10th July 1553 in order to be proclaimed Queen. 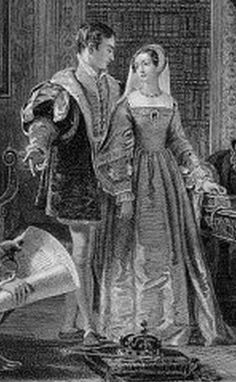 Lady Jane Grey arrived by barge and was accompanied by her husband, her parents and her husband’s mother. They had travelled from Syon and were greeted by Jane’s father in law, the Duke of Northumberland and councillors who escorted them into the Tower. Upon arrival at the Tower it is believed that Jane felt faint trying on the crown as well as argued with her husband and his mother after she declared that she would not make him joint monarch but instead the Duke of Clarence. It was later in the evening that the letter from Mary arrived addressed to the Council declaring herself as Queen. Just a few short days later Mary would be proclaimed the rightful Queen. After King Edward VI’s death the country was left unsure of its future, the young King had declared just days before his death that he wished his cousin Lady Jane Grey to succeed to the throne upon his death, however, this contradicted his fathers, King Henry VIII, Third Act of Succession which declared if Edward died with no children then the throne would go to the Lady Mary, Henry’s daughter with Katherine of Aragon. Mary had been informed of her half brother’s death on 7th July 1553 at Euston Hall, Thetford where she was staying with Lady Burgh. Mary travelled to her home at Kenninghall, Norfolk and declared to her household that the King had died and therefore “the right to the crown of England had therefore descended to her by divine and by human law.” Her household proclaimed Mary Queen of England, unaware of what Edward had done to alter the line of succession. Little did Mary know that she would have to fight for her crown over the coming days. On this day in 1533 – King Edward VI died. This illness came just months after he had suffered from measles and smallpox so his immune system was already in a weakened condition. Edward had improved slightly but by June it was looking likely that the young King would not survive. 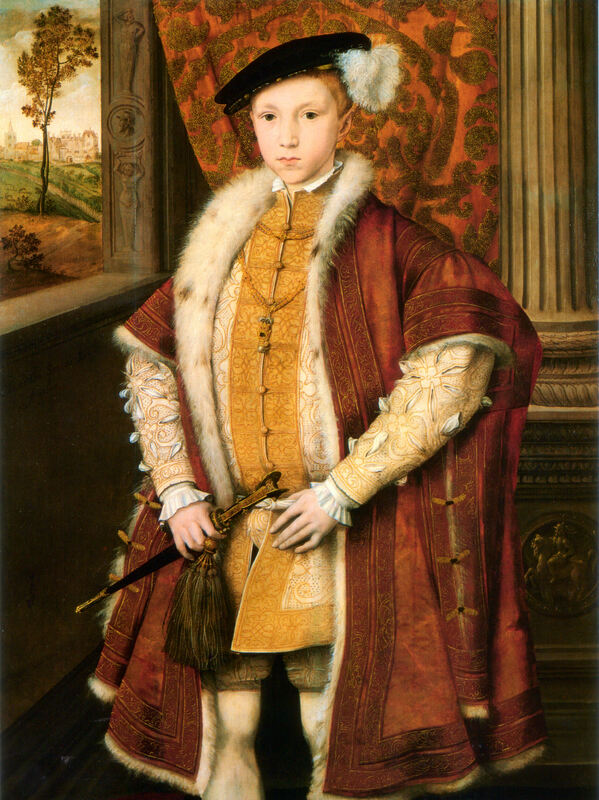 King Edward VI, aged 9. King Edward’s illness would come in stages and in April, Edward was seen walking through the park at Westminster before moving to his palace at Greenwich but by the end of April he was again weak and suffering. However, just days later on 7th May his doctors were expecting a recovery and Edward sat in a window overlooking the Thames watching the ships sail past the palace. Edward’s recovery was not long lived and on 11th June 1533 Edward relapsed. With this the seriousness of Edward’s condition had become apparent and the likelihood of him surviving his illness was slim. Edward was soon bedbound after his legs began swelling and he was unable to stand up any longer. With this news his council sought to change his father, King Henry VIII, will so that Mary would not inherit the throne and return England to Catholicism. Edward did not want to see the country returned to the old religion but also he felt that Mary and Elizabeth were both illegitimate and therefore illegible to take the throne. A document was drawn up entitled ‘My devise for the succession’ in which Edward overruled his father’s wishes in the Third Act of Succession and named Lady Jane Grey, Edward’s cousin, as his successor. On 15th June Edward summoned his high rank judges to his sickbed and demanded their allegiance. He then called upon his lawyers and councillors to sign a bond that would ask them to perform his will faithfully. This would also see that Lady Jane Grey was placed upon the throne even if they believed the throne should pass to Mary. On 21st June the ‘Devise for Succession’ was passed to and signed by hundreds of councillors, peers, sheriffs, bishops and archbishops who all agreed to follow Edward’s wishes. Many would later claim that they had been bullied by John Dudley, 1st Duke of Northumberland and father in law to Lady Jane. King Edward VI’s final appearance to his subjects was on 1st July 1533 when he appeared at a window at Greenwich Palace and it was noted how thin he looked. Crowds continued to gather in hope of seeing their king but after two days the crowds were told that the weather was too cold for Edward to appear. On 6th July at 8pm King Edward VI died, the cause of Edward’s death has been debated ever since with suggestions of tuberculosis, bronchopneumonia and even poisoning. However, it is likely that tuberculosis was the most likely cause of death for the 15 year old King. 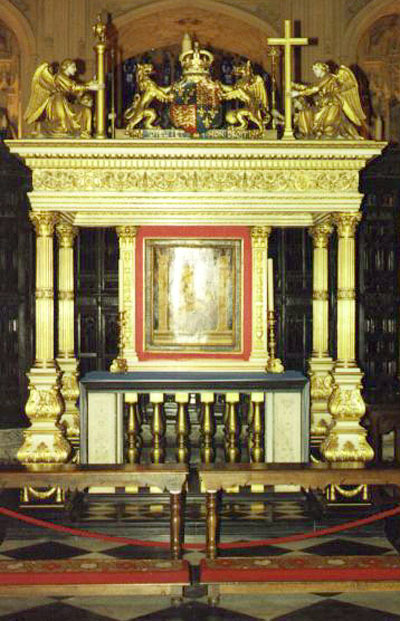 Edward was buried at Westminster Abbey in the Henry VII Lady Chapel on 8th August with the ceremony presided over by Archbishop Cranmer. Edward’s death would send England into division over the new rightful monarch.